We were up early and Koncho, our driver called right at 6.30am. Before 7 we were already on the road in yet another Innova ride. The road to Pangong is first down south of Leh and then travels eastwards. Its a fairly long journey for the Ladakhi terrain, around 160km through the tough mountains. Our last bike ride experience had ensured that we let go of any idea of traveling to Pangong on the bike. The bike owner had said the road passes through Chang La another high mountain pass and there are no petrol pumps till you return back, so fuel has to be carried on the bike. With our great experience the other day, Innova was a much comfortable choice. Our first stop was at Karu, a junction where the road from Leh heads down south towards Manali. Koncho said the petrol pump was the last one enroute to Manali, next one would be only after 350km in Himachal Pradesh. Our road however moved eastwards, after a heavy and delicious breakfast of Aloo parathas by a non-ladakhi woman. I guess she was from HP by the looks of her high cheek bone, frosted rosy cheeks and blue eyes which weren’t narrow. Soon enough the road started climbing upwards and the tarmac converting itself into globules of white rocks. As we climbed higher we overlooked Sakti, a village where our nodding Padma had gone visiting her natives, they too called it गांव. The road worsened, he said few days back there was a rainfall, due to which a lot of sand, stone and soil had come down from the hills and uprooted and spoiled the road. The nature of the soil and rocks was very lose, you could disturb the balance by a minuscule force. Climbing up, I asked Koncho what do the locals do when the tourist season is over, he replied many go down “South” (He always referred Ladak as North, नॉर्थ के लोग) while others like him drove trucks, cars for the Army as even the army’s drivers weren’t skilled enough to drive on the treacherous, slithery, icy single-laned roads on the mountains. We crossed Zingral and kept climbing, the climb never seemed to stop, it kept getting icier even though we were quite cosy in our closed windowed car. Along the near summits we could see white icy slopes which kept getting bigger. Then we turned up to see a fairly high traffic junction. ये आगया चांगला पास ! I got my phone and checked the altitude, 5391m above sea level. It was one of our highest passes. We got out for a customary photo opportunity with the prayer flags tied around the board. As we came out the air was extremely cold after the warm cabin of a car. We got into the tea shop and came out to see frizzy white specs of dust flying only to realize it was snowing. The weather hadn’t looked good from down with lots of clouds, but at this height it’s not the rains, its snow! Little ahead the road seemed to have been cut through ice, where we stopped for our fist ice ridges after ZojiLa. This one was massive and from looks of it didn’t seem it ever completely melted. While were at our photos, I heard bike crash and slide, we ran quickly to lift the rider and the pillion. I tried lifting the Avenger but felt I could hardly pull it up. With the short run of few meters at this altitude, I was panting hard, lifting the machine was another big task. The guys were OK and had slipped thanks to the gravel road. बरं झालं बाईक्स घेऊन नाही आलोत, अवेंजर तर फालतूच् आहे ! We started getting down Changla and the weather seemed to improve with more sunlight piercing down on the boggy terrain and it started to drizzle. Koncho saw an entourage of cars coming from the front, parked his car on the side and jumped to the other side of the road, bent with praying hands as some Lama passed through. When we were completely down from the hill following a partially dry river with mossy wet grasslands he stopped his vehicle to show us black colored yaks grazing. Little ahead he also showed us the Marmots, a big rodent like creature जो छे महिने सोता है as Koncho had put. We met a foreigner on BMW GS 650 who asked us to search for a black bag that had fallen off from his bike. Just few minutes ahead we found it and Koncho asked another set of bikers towards Changla to let the foreigner know that an Innova with no. XYZ had found his bag. The journey kept going up and down the mountains and it was around 2.45pm when we first spotted a turquoise blue flat terrain amidst gray-brown arid soil. It had to be Pangong Tso or Pangong Lake. As the lake approached, its size got bigger and the water ever more beautiful. What perhaps was more beautiful was the high saturated blue in the otherwise relatively flat-colorless rocky mountains. 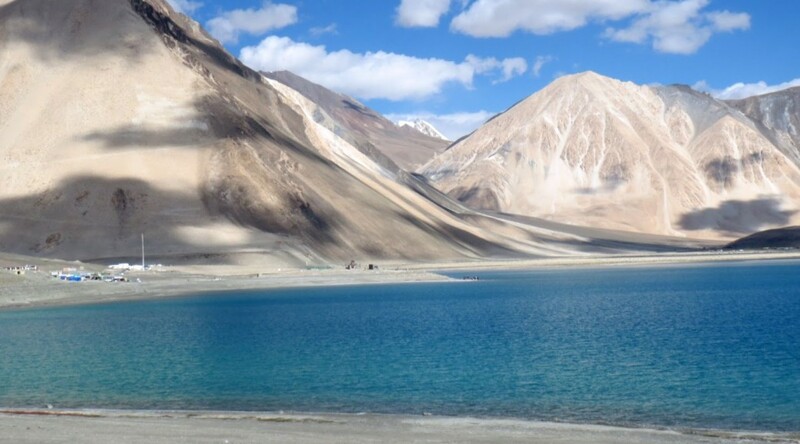 Pangong lake is a huge long lake over 100km long at an average elevation of 4250m above sea level. Only a third lies in India the other in Tibet. We stopped by a tent-house at our first stop near Lukung to check if the tent accomodation was good enough, it definitely was so was its cost, ₹5,000/night for 2. The GS 650 rider came back, we gave him his bags and discovered he had travelled all the way from Germany on bike via Turkey, Iran, Paksitan… Crazy ! We decided to move on, and got to the 3-idiots climax scene where Kareena demonstrated how the nose does not stand in the way. It was extremely windy and cold. Koncho said that it’s always windy after noon the wind subsides only by night. We could barely walk idly along the lake and had to resort to the car. We fixed another stay with firm roof as Koncho said, tents would be very cold in the night. Had a nice warm late lunch and head to rest a little. In the evening as the sun went down, we got back on lake which was close by the stay. After dinner at the common dining area, we got back on the lake where the wind was killing ! Sleep was quick to accompany. I got up around 6am naturally without any alarm and saw it was bright outside, I woke up Sourabh and ran towards the lake not wanting to miss the sunrise. Few photographers had already set their cameras for the grand arrival of the Sun on the Ladakhi high-rise water body. Back at the lodge, Koncho was fooling around with other drivers. He asked if we got good sleep as he said people from “South” don’t sleep well here. But we were lucky enough, perhaps a day’s rest had helped us. We left early by 10am back for Leh and reached there early afternoon after having another lunch of aloo parathas at Karu. We just roamed in the market for the rest of the day and planned to use up our buffer day tomorrow for some shopping and local markets hopping. Great tips! well i’d recommend that if you are an experienced one then just go for it, but if you are an amateur one in this activity then before trying this you should try Dehradun-Mussorie or Jalori Pass in Manali. Self supported or vehicle supported, it depends on you.